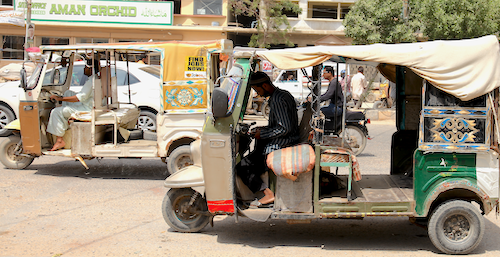 A Roshni Rides driver waits for a customer. “Roshni Rides: Pricing Transportation for the Underserved,” by Can Uslay examined how the enterprise, which provides affordable, dignified transportation to refugees and was awarded the $1 million Hult Prize in 2017, dealt with many challenges as it prepared to launch. For the case, Uslay followed the Roshni Rides team as it tried to find a price point that made it affordable to its customers while also generating enough money to make future expansion possible. 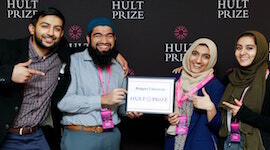 The Hult Prize-winning team from Rutgers University. The case competition celebrated and commemorated WDI’s 25th anniversary in 2017 and its long history of developing market-based solutions in low- and middle-income countries around the world. It was open to students and faculty individually or on teams, and had to describe a dilemma or challenge faced by a company or organization related to creating, implementing, evaluating and/or disseminating market-based solutions in developing countries. The first round of judging was completed by an internal WDI team. However, the final winners were determined by an esteemed group of academic professionals which included Kim Bettcher, director of knowledge management at the Center for International Private Enterprise, and John Branch, Gautam Kaul, and Jordan Siegel, all professors at the University of Michigan’s Ross School of Business. The second-place winners were Fernando Roxas and Andrea Santiago from the Asian Institute of Management in the Philippines. The pair wrote, “Milking the Future: DVF Dairy Farm Partners with the Filipino Farmer,” that explored whether Filipino farmers would be able to produce sufficient quantity and quality of carabao (water buffalo) milk to satisfy the demands of the DVF Dairy Farm customers. In third place was “Chanderiyaan: Weaving Digital Empowerment into the Indian Handloom Industry,” by three professors from the FORE School of Management in India. The case, written by Bishakha Majumdar, Sriparna Basu and Shilpi Jain, studied a successful 15-year-old handloom enterprise as its founder considered making it an independent, self-sustaining social enterprise. Uslay was awarded $3,500 for his first place win and donated the winnings to the “noble mission” of Roshni Rides, he said. The second place team won $2,500 and third place was awarded $1,000. Additionally, each winning case was professionally published by WDI Publishing. Uslay knew about Roshni Rides because one of his students was the organization’s chief marketing officer. Uslay attended the local stage of the Hult Prize competition at Rutgers in 2016 when Roshni Rides won the award. He said he was proud to watch the team prepare for the Hult Prize competition, raise money to pilot their project and then win the global finals. Uslay said his case is unique in that it combines essential marketing planning issues with lean startup thinking. It also demonstrates what to do when you have key metrics and formulas but are unsure how to apply them in situations with imperfect information and high uncertainty. For Roshni Rides, Uslay said they could do a SWOT analysis, create a business model canvas and develop a five-year projection but they were doing a start-up in an environment where all the parameters were changing. He said for his case, classroom discussions can be conducted at a high level or push deep into the details. Photos courtesy of Roshni Rides.